Back in April, two seasoned veterans of New Mexico MMA touched gloves and battled back-and-forth for fifteen minutes before a Judge’s Decision was rendered. During the three round affair, controversy would rear it’s head and that controversy would carry over into the Judge’s Decision. Now, a short three months later, the two veterans will once again enter the cage to battle one another; only this time around, the hometown advantage will change and intrigue of the bout has grown immensely. When Mikey “The Burque Bulldog” Lovato and Gene Perez paired up for some MMA action at Legacy FC 30 on April 4th, the style mismatch made it very easy to analyze prior to the competitors walking out to fight. Most fans of MMA who understand the different styles of fighting knew that if Lovato got the takedown, that he would have the advantage in the fight and if Perez was able to keep the fight standing, that he would have the advantage in the Flyweight bout. 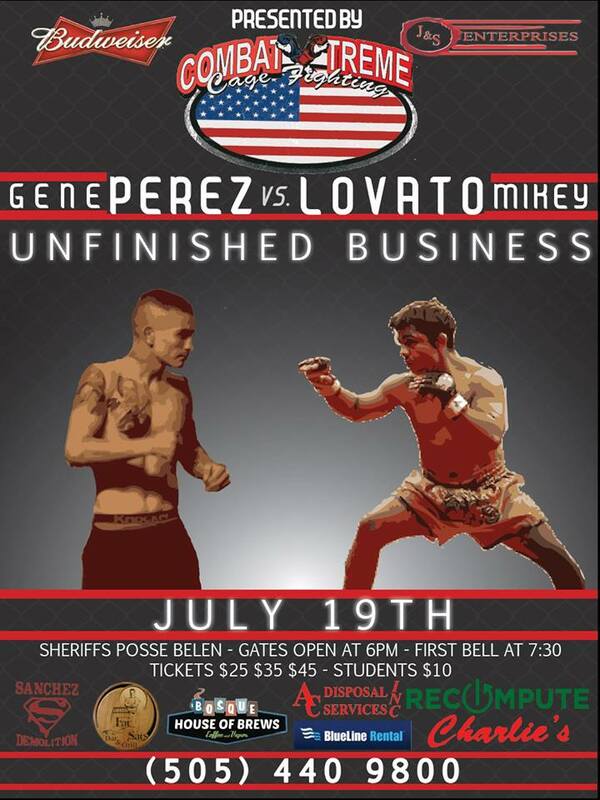 On July 19th, Mikey “The Burque Bulldog” Lovato will take on Gene Perez in his hometown of Belen. The fight will be a rematch of their competitive April 4th bout for Legacy FC 30.
ach round. When the scorecards were read, it was announced that Gene Perez earned the unanimous decision victory. The decision was immediately disputed by many in attendance and the fallout from the decision definitely made its way to social media. One could argue for a Lovato decision as he was able to earn takedowns and control the fight through top control. The other end of the argument is that Perez fought valiantly from bottom position and found his own openings on the feet when he was able to distance himself from Lovato’s takedowns. I don’t believe there is a definitive argument in favor of either fighter but there were dozens of people in attendance who left with a sour taste in their mouths as they believed Lovato had done enough to win. But there was another controversy coming out of the fight and it happened prior to the final bell. It was alleged that during a Lovato takedown, Perez landed awkwardly and verbally submitted to the referee. While the details of what Perez may have cried out has never emerged, it could be assumed that a hyper-extension or dislocation could have occurred that forced Perez to yell in pain. In most rules meetings and within the confines of the United Rules in MMA, yelling out in pain is a means of submission. In pre-fight discussions, referees alert fighters that if they yell out in pain, that in efforts to protect fighter safety, that they can and will call an end to the bout. Referee Joe Coca heard no such sound or verbal submission. Part of the storyline goes on in that Lovato could have been more aggressive or wouldn’t have abandoned a possible dominant position if he had ignored the sound or verbal submission. While the old cliché is that the fight isn’t over until the referee pulls you off of your opponent, these storylines definitely carry some intrigue heading into the rematch. While this fight will draw nearer the end of Lovato’s incredibly successful career, Lovato will now fight Perez in his hometown. In the first go-round, Perez fought Lovato in Albuquerque where “The Burque Bulldog” has an impressive following. While Lovato’s departure from active competition will end a great chapter in New Mexico MMA’s history, the fight offers Perez a chance to get his career on the winning track with two consecutive wins over a fighter who would be a first ballot Hall of Famer if New Mexico Combat Sports ever entertained the idea of opening their own Hall of Fame. While details of the rest of the fight card has yet to be announced, some rumored participants are Derek Perez and Joe Salazar. The fights will be held on July 19th ay the Sheriffs Posse in Belen. The gates will open at 6 PM and the first fight will start at 7:30 PM. Tickets start at $25 and go up to $45 with a discount rate of $10 offered to students. Call (505) 440-9800 for more information.